It’s that time, again! Central Community Dog Park “Spring Festival” is on Saturday, April 13 from 11 a.m. to 1 p.m. The event is nothing short of a dog-gone hoot with special treats for you and your pooch. Your dog will have the opportunity to run around the one-acre fenced park doing what dogs do to have a good time while you visit with other dog-loving owners. 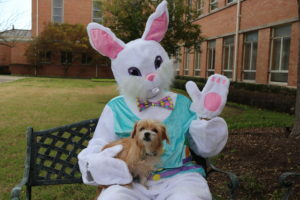 That famous spring-time rabbit, Peter Cottontail, will be on hand for some great photo ops. You can even order your 2019 “Spring Fever” Dog Park T-Shirt on-line by visiting centraldogpark.com. The dog park is located at 4711 Westside Drive. Established more than a decade ago, it has continued to grow in popularity with the neighborhood and the community. The rustic setting, shaded by mature Live Oaks, offers a peaceful sanctuary for enjoying nature and spending time with your best friend. There is plenty of seating, a dog bath station, reading material and a separate area for small dogs. The adjacent paved parking lot provides accessible parking. Come join the fun. It’s free and all are welcome!